A National Artcraft GIFT CERTIFICATE is a wonderful and easy way to surprise a friend, relative or business associate involved in the creative arts. Gift Certificates are available in multiples of $25. To order just put the number of units wanted in the Qty. box below. (Example: For a $100 Gift Certificate put 4 in the Qty. box.) We�ll send you a Gift Certificate equal to the total amount you indicated. To order more than one Gift Certificate simply use a new order line for each certificate wanted. 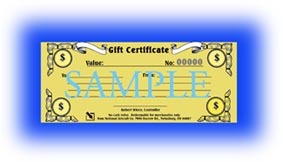 Gift Certificates have blank spaces for your name, the recipient�s name and a short message. Gift certificates are valid for one full year from date on the certificate. Give a gift of creativity.